So hey! I'm finally up-to-date with my posts! I am now writing about the week I have just done! I hope you've enjoyed reading them so far and I hope I've helped the newbies out there, who started off exactly as I did, the confidence to keep going! If you love it as much as I do, you won't want to quit! So this week I didn't get the chance to practice with my Mum again, but that was the least of my worries. Up until now, I have always gone to Derby practice with friends. It's good moral support and it makes it more fun. However, this week, none of my friends could make it! Eeek! The first issue on my mind was "What if I hurt myself and I have to drive myself home?!" until it occured to me that I drive myself home anyway! "What if I hurt myself and no one helps me?!" until I remebered that there is always someone with a First Aid Kit there! I was running out of excuses, so I took a deep breath and headed to the skating rink without trying to think about it. A group of ladies were standing outside the rink waiting to go in. 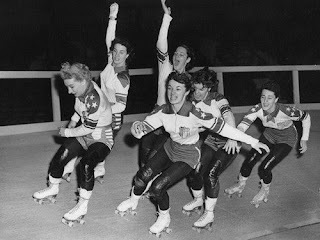 All of them were better skaters than me, some of them my Roller Derby idols as I'd seen and cheered them on at bouts. It was quite intimidating. I shyly stood at the edge of the group and waited to go in. "I love your skates!" said one of the girls "They're just so pretty!" This made me smile. "Thanks, I do rather love them!" The ice had been broken. I felt a lot more comfortable and joined in with other conversations. My anxiety levels subsided. This is another thing about my roller derby team. I've heard about some teams being quite cliquey and the more experienced skaters can be quite elitist, but ours are so lovely! You always feel part of the team no matter how well you can skate. Everyone is super friendly and will always talk to you and try to help you out. It's like one big family! I put my skates on and decided I'd watch other people warm up before I felt like I wanted to skate. Everyone moved on to the centre of the track so I decided to skate up and down the side by myself. It was nice because I could just concentrate on what I was doing but I did hear some sweet comments from the center such as "Awh, I didn't want to leave her!" which some may find patronising, but I found nice as it shows they care. After the warm up, I skated to the middle for stretches and then headed back over to the newbie area. It turned out that I was the only one this week. What used to be a group of six of seven had been reduced to one. One of the skaters I knew told me that, if I was happy with it, I could stay over here and she would help run through the skills with me. First, we started with the basic Derby Stance. We practised skating up and down in Derby Stance until I got used to it. Next, we did falls. I was told to mix it up a bit and try all three falls - single knee, double knee and 4-point. Most of these I was comfortable with, except falling on my left knee. So I was able to practice that until it seemed to click. Next, 180-knee turns. I had tried these before and I gave them a quick go, but I was too scared to skate fast enough to get enough momentum so we then moved onto stops. I'd never tried any of the stops, but I remembered being told about my wheels preventing me from doing certain things and was convinced stops would be one of them. I mentioned this to my coach who called over a skater with the same skates and wheels as myself. She said that she could stop just fine. It took more work as the wheels were more slippery, but she could do it. This meant that if I could do it on my wheels, I might find it even easier on indoor wheels. This was reassuring! The thing I loved about my one-on-one session was that the coach could really help me with what I was doing. In usual sessions, the skills are demonstrated, practiced for a little while but then it moves on to another quite quickly. This week, I could practice one skill for as long as I wanted and the coach was able to watch my feet the whole time so she could then tell me what I was doing right and what I could improve. For example, with T-stops I was told "You got the position perfect that time!" or "Ah, you're putting your pressure on the middle two wheels. You can use the front two, or all four, but the middle two cause cause you to break your ankle if you put too much pressure on it and fall", etc. I think this week really helped me improve my skills! I did fall over backwards again, but this time I knew to fall on my bum rather than my coccyx and managed to get up, if in pain, but not in agony, and carry on skating! And, what's more, I'm getting more and more confident on my skates. I love it!